Deal Physical damage to target enemy and inflict Offense Down and Defense Down for 2 turns. Target Lock: Dispel all buffs on Target enemy. Whenever Umbaran Starfighter attacks, it gains 30% Turn Meter and target enemy gains 20% Turn Meter. 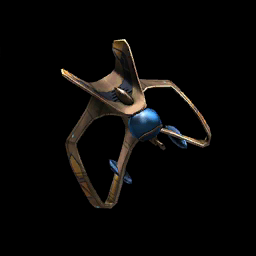 Additionally, when Umbaran Starfighter attacks, it gains 5% Offense (stacking) and loses 5% Defense (stacking) until the end of the encounter. Enter Battle: Remove 25% Turn Meter from all enemies, which can't be Evaded, and grant all allies Defense Up for 2 turns. Then, inflict Target Lock on all enemies with 0% Turn Meter, which can't be Evaded or Resisted. Inflict Target Lock for 2 turns on target enemy, which can't be Resisted, then deal Physical damage to each Target Locked enemy. This attack deals +20% damage for each Target Locked enemy.